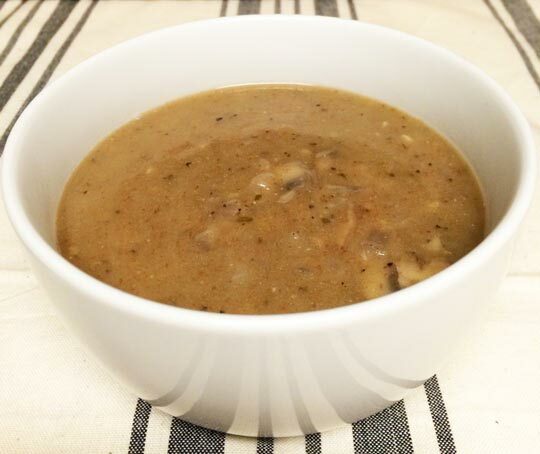 A healthier version of a home-style favorite, this mushroom gravy combines vegetable stock with garlic, mushrooms, and a touch of creamy almond milk. It is thick and savory and has everything your taste buds desire. Use to top potatoes, a lean steak, or a vegetarian lentil loaf. Delish! In a large skillet, melt the butter over medium heat. Add onions and cook until translucent. Reduce heat to low, then add mushrooms and garlic. Continue cooking until mushrooms are soft. Add flour to pan and mix well. Immediately whisk in vegetable stock and almond milk until they are well-combined and the gravy is lump-free. Add oregano. Bring to a simmer, stirring occasionally. Cook for 5-10 minutes or until gravy has thickened. Tip: If the gravy becomes too thick, simply add one tablespoon of water or milk at a time until the desired consistency is reached. The longer you let it set, the thicker it will become. *Earth Balance is a natural, vegan, buttery spread. Since it is plant-based, it does not contain any dietary cholesterol. However, many feel that it tastes just as good as real butter, so you can enjoy what you're eating while feeling much less guilty about it. Earth Balance offers a variety of spreads, so you can pick the one that's right for you—and they all contain beneficial Omega-3's. In this recipe, you can stick with Earth Balance for a healthy alternative to butter that tastes nearly the same. You could also use real butter, which brings its own set of pros and cons. Or you can substitute coconut oil for the spread. The oil will lend a hint of its flavor to the gravy, but as long as you're a fan of coconut oil, you probably won't mind it. In fact, we think it's quite delicious.